Do Funerals Matter? is a creative interweaving of historical, sociocultural, and research-based perspectives on death rituals, drawing from myriad sources to create a picture of what death rituals have been; and where, especially in the Western world, they are going. Death educators, researchers, counselors, clergy, funeral-service professionals, and others will appreciate the book’s theory- and research-based approach to the ways in which different cultural groups memorialize their dead. They will also find clear clinical and practical applications in the author’s exploration of the five ritual anchors of death-related ceremonial practice and help for professionals counseling the bereaved surrounding funerals. Based on nearly three decades of research and teaching on funeral rites, this volume promises to fill an important gap in the cross-cultural literature on bereavement, while answering an important question for our generation: Do funerals matter? 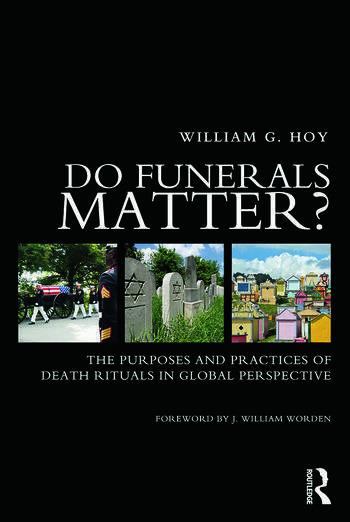 William G. Hoy, DMin, FT, has studied funeral rites for three decades, examining how they are used around the world to help mourners make sense of death and to negotiate the radical changes that come about in the aftermath of a loved person’s death. He has worked as a clergyman, pastoral counselor, and scholar in congregation, hospice, bereavement center and university settings. Dr. Hoy holds the Fellow in Thanatology (FT) advanced practice credential from the Association for Death Education and Counseling, and teaches in the Medical Humanities Program in the College of Arts and Sciences at Baylor University in Waco, Texas.